"She was just a sweetheart she was just a good puppy," Kitty Mazurkiewicz said. The little three-month-old sweetheart Mazurkiewicz described was Harlee--a Bernese Mountain Dog-Newfoundland mix. "I brought her home, four, gonna be five weeks ago tomorrow." But things took a turn for the worst last week. "It started last Saturday with the first case that I had seen," Dr. Lindsay Vanvolkinburg, a vet with Brighton-Eggert Animal Clinic, said. That "it" is Leptospirosis or "Lepto" for short--a potentially deadly bacterial disease that infects the kidneys and liver. It's often transmitted through rodent urine--in this area--rats. 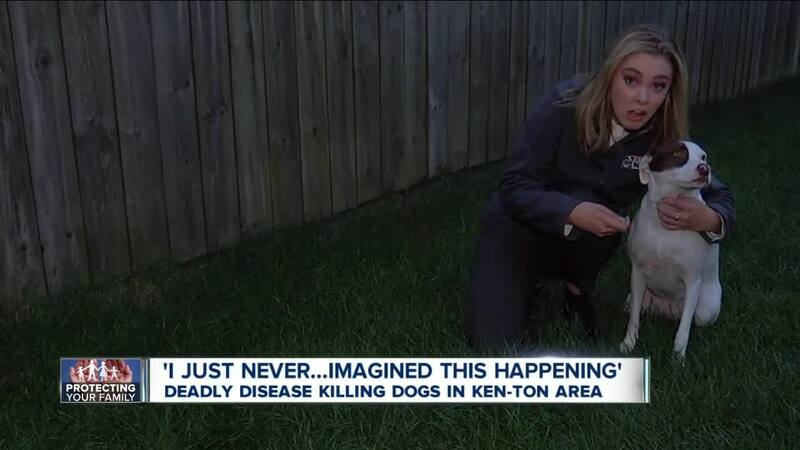 Over the past week, Brighton-Eggert Animal Clinic has seen three cases in the Kenmore area, two of those, resulting in death. "We see if equally across breeds, sizes, it unfortunately doesn't really matter for most of them." The CDC now recommends that all dogs get the Lepto vaccine. When an animal gets the vaccine for the first time, it's a two-shot series. After the first shot, a second shot is administered a month later, which is good for a year. Boosters are recommended afterwards. In Kitty Mazurkiewicz's case, Harlee already received her first dose before she contracted Lepto. After Harlee's death, Mazurkiewicz made sure her other dog, Gracie, and her mother's two dogs got booster shots. If your furry friend doesn't have the vaccine, Dr. Vanvolkinburg recommends contacting your vet immediately to set up an appointment. She also added that if your pet experiences any of the symptoms, to seek medical advice immediately.